8th October 2017 – At times the marathon can be very cruel. Months of hard work going into one day, one effort, one journey and if the outcome is not the desired one it can be a tough blow to take. 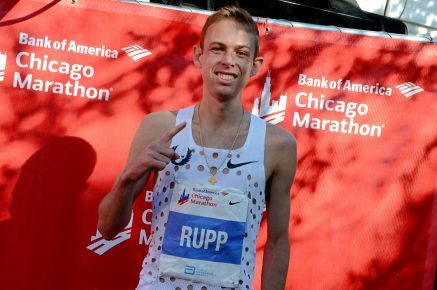 However, when it does go right it can be one of the greatest feelings and BOTH Galen Rupp (USA) and Jordan Hasay (USA) got to experience that on Sunday morning in Chicago. Galen was running his fourth marathon (having been on the podium in all of his first three) and was among a very large lead pack that passed the halfway point in a conservative 66:10. From here the pace did slowly build but through 30k the lead group was still six athletes and they were running 2:11 pace. Despite possessing the fastest track times of anyone in the race Galen was not prepared to leave this to a sprint finish, and from mile 21 he made a move that saw him break clear and build a winning advantage. Running sub 4:40 mile splits all the way in saw Galen cross the line first in a new personal best of 2:09:18 (63:18 second half) and become the first American born winner of the men’s race in Chicago for 35 years. Jordan was running just her second marathon, but after a debut run of 2:23:00 in Boston there was real interest to see what she could do here. Early on Jordan had a big decision to make as the women’s field went out fast. Did she run with the leaders or hang back and run on her own?. Jordan was brave and laid it out there, wanting to “give herself a chance” she later told reporters and she passed the half in 69:13. Despite the two leaders edging ahead, Jordan stuck to her task and in the final 2km was even able to lift herself one last time. A strong sprint finish saw Jordan cross the line in third place and with a new PB of 2:20:57, making her the second fastest American of all time and the fastest ever on US soil.